AmpliVox now offers a Custom Megaphone Logo Program, customizing the S602 megaphone with your company logo. Our custom logo solutions allows your brand to stand out at your next event, setting your organization apart while enhancing your professional presence. Promote your company identity or school team with a personalized megaphone with your business logo. 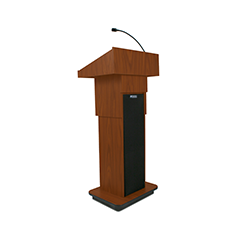 Great for event organizers or to ID equipment for law enforcement and public safety agencies. Logo Size Requirements: Two sizes are available. Logo can not be more then 5 inches in length and 3 inches in height or no more then 3 1/2 inches in diameter. Logo appears on both sides of megaphone. The S602 Mity-Meg 25-Watt Megaphone is lightweight and powerful with new Piezo dynamic technology. Comfortable pistol grip and 3 modes: Talk, Siren and Whistle with up to a 1 mile (1760 Yards) sound coverage. Weatherproof high impact ABS plastic and steel construction that can take abuse, an essential addition to your emergency kit. Battery indicator light shows power status (low, med, hi) on the outer housing. Easy to use battery cartridge, half the weight and twice the battery run time making them lighter, louder, and run longer than other megaphones on the market. Battery indicator lights with whistle, siren and talk functions. Adjustable Volume control below the speaking area of the meg. The Custom Megaphone Logo Program also includes the S1405 Rechargeable Lithium Battery Pack with integrated wall charger to power the megaphone, otherwise 8 C-cell batteries may be used as a power source. The S1405 Rechargeable Lithium Pack coupled with the Battery Indicator lights of the megaphone guarantees you never run out of power for maximum safety and security. Battery Charger is built-into the battery Case with LED Charge Status Indicator and automatic charge protection (stops charging when batteries are full). Using the S1405 Rechargeable Lithium Pack saves you money from purchasing C-cell batteries, can be reused hundreds of times and last for years. A fully-charged battery will provide 8 hours of typical operation (defined as speaking 35% of the time at mid volume) and 6 months of standby / idle time. 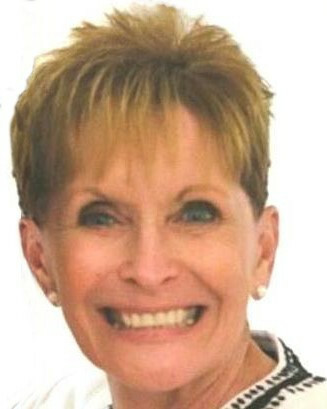 For more information, please visit the Custom Logo Megaphone Program or call us at 1-800-267-5486. 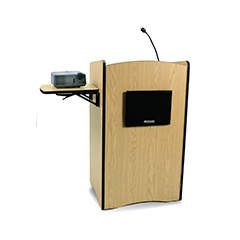 AVTEQ is a leader in the AV furniture industry and the largest supplier of videoconferencing carts around. 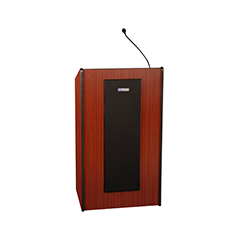 You might remember our previous partnerships with them, which have included making our Line Array Speaker System available as an accessory to their video conferencing carts. 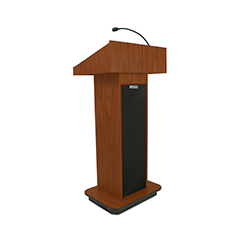 Both companies have enjoyed teaming up to offer the best in audio and video equipment to consumers on a single front, which is why we are excited to announce a new partnership: AmpliVox Sound Systems will now be the exclusive supplier of lecterns to AVTEQ’s product line. You can learn more about our latest partnership with our friends at AVTEQ by visiting rAVe Publications. To stay up to date on the latest AmpliVox news, be sure to “Like” us on Facebook and follow us on our LinkedIn company page. At this year’s America’s Cup racing season, LaLa Hill-Courtney took the role of the “welcoming ambassador” and cheerleader, greeting patrons of the event and informing fans of the America’s Cup Park’s attractions at Piers 27/29. Sitting tall and pretty atop a 6-foor chair dressed in a red America’s Cup outfit accentuated with a pair of shiny golden sneakers, LaLa volunteers her time making sure all in attendance receive a great experience and get to see the best of the park. As Lala sits on top of her high chair that she has wittily named “LaLa Perch”, she communicates to the crowd using a S602M Mity-Meg Plus Megaphone from AmpliVox. The megaphone helps LaLa to amplify her voice as she notifies guests of the Parks other features such as the Kids Zone, visiting Food Trucks, the “Flying on Water Experience”, and occasionally sings to crowd as she welcomes them to the park. LaLa works the megaphone all day long and tries to make eye contact with the few who pass by. She talks about the weather and the food, and reminds people to shop at the Louis Vuitton gift shop. Easy to use with detachable corded mic and shoulder strap for all day use. Effective range can reach up to 1760 yards / one mile.